Joey Tomei joined Caesar Creek Soaring Club in May 2014. 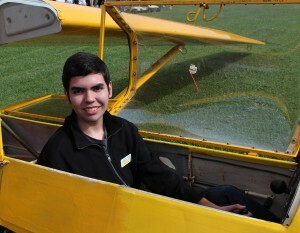 He has had a strong passion for aviation since early childhood. His first experience with flying was at the Ohio State University Airport, where he had an introductory flight in a Cessna 172. Ever since his first flight, his passion for flight only increased. When he learned about the Caesar Creek Soaring Club he eagerly became a member. Besides soaring at the club, Joey plans to take flight lessons at OSU airport to earn his private pilot’s license for powered aircraft. In addition to his interest in aviation, he is an avid bird watcher and a member of the Ohio Young Birders Club. As a birder, he has been to numerous popular birding spots including Magee Marsh near Lake Erie, Colorado, Delaware, and Costa Rica. As of 2014, Joey is a sophomore at Dublin Jerome High School, and he is interested in studying biology and aerospace engineering in college. Note: Google+ automatically selects 720p instead of the full resolution of 1080p, but you can manually increase the resolution to 1080p by using the settings on the video.